I’d never make an art critic. I don’t know enough about the history of the subject. Still less with regard to technique or style. Like the average Joe in the street I tend to go, initially at least, with the response the piece engenders in me: what am I looking at, how does it make me feel? What kind of reaction do I see in other viewers? Following that I tend to look for the backstory: when was the piece produced, and who if anybody is in it, and why? I know little about the above painting beyond that it was produced in the eighties. I don’t even know the name of the artist (but will attempt to find out*). I do love the piece though. I love the line and the colour. It exudes warmth, and time. 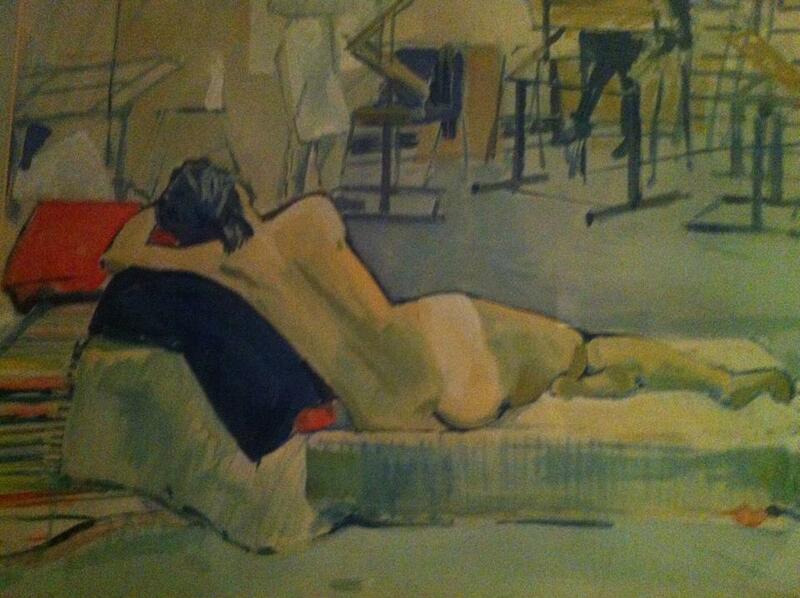 Looking beyond the subject, the art school background floods me with memories of life-modelling in London in the nineties , penniless – evenings, wet, cold, warm, damp, cramp, sleep, cash. I’d dearly love to have this on my wall. I think it’s quite beautiful. Regarding the backstory I know quite a bit, for I know the life model. It’s Sara Park, my children’s Grandmother. Sara was born in Scotland in 1940 and died in Newcastle upon Tyne, England in 2010 following a battle with pancreatic cancer that I wish she had won. Sara Park was one of the most inspirational women I have ever met. I never knew her in a previous incarnation as a mother of three and wife to an alcoholic. No doubt scars and influences remained from both roles and these may or may not have contributed to the shy humility Sara showed to the world. A humility that drew you to her in an incredibly disarming and calming fashion and, rather than hide who she was as shyness often does, exposed her persona bare, as truth, and honesty. By 1981 Sara had begun a different life and travelled the world – mostly on her own but later with her partner, Mike – a man who I recall laughing more than speaking. Fluent in Spanish, she favoured South America and covered it extensively, once returning with an indigenous native guide, and, presumably, lover (whose real name we couldn’t pronounce but whose ‘Christian’ name was Sebastian). We all fell in love with Sebastian – who could speak no English. Sebastian fell in love with us – and with my navy divers knife which he took back to the South American jungles. An eddy in entropy had produced a creature that didn’t want to be anything in particular, but became something wonderful simply by consequence of doing, and boy did she do. Sara wrote, extensively, stories, poems, letters. Created clothing (and food) beyond description, and she lived in an Aladdin’s cave of culture, clutter, and colour. Her dinner parties were not to be missed, either. If, indeed, you could find a space at a table covered with writings, paint, rolls of cloth, books, plants and other detritus of a life too full to tidy or clean. The food is, sadly, long gone – though I still bump into people wearing a ‘Sara Park’ original. Sara funded her travels through having students lodge with her. Many would become life-long friends. How could they not. Sara Park, daughter, sister, mother, grandmother, partner, lover, seamstress, cook, artist, writer, poet, traveller, adventurer, friend. Sara Park – Life Model. There is no better description.